We’re back from a refreshing June visit to Iceland. I can recommend a visit to this gentle country to anyone and without reservation. If you’ve traveled in other parts of Europe, there will be no surprises; if not, the cultural shock will be minimal. Driving the paved roads is a breeze, traffic control minimal, everyone speaks English and credit cards are accepted nearly everywhere. The unit of currency is the Icelandic Krona or ISK. As of today the exchange rate is 122.85 ISK to the dollar. Gasoline was in the neighborhood of 208 ISK per liter, so gas seems a bit spendy to an American. I would compare the prices one will encounter as a tourist to be in the range of a visit to NYC or Boston. Flight arrival happens at the town of Keflavik (KEF) southwest of Reykjavik. Reykjavik is a half hour drive north from the airport. The famed Blue Lagoon (Bláa lónið) spa is a short drive south from Keflavik. Be warned, reservations are required and the earlier the better. Our experience was that they would not allow walk-in visitors to gain or even schedule entry. Online registry is done exclusively. This spa is an artificial body of geothermal hot spring water that has its source from the adjacent geothermal plant Svartsengi. Iceland is a country with 330,000 inhabitants, 200,000 of which live in Reykjavik. The population density is low. It is like taking Boulder county, Colorado, and plopping the population onto an area the size of Kentucky. We saw none of the garish tourism blight in the form of signage and souvenir shops so ordinary in the US. While folks back home were sweltering in the heat we enjoyed the benefits of North Atlantic climate, namely 55 °F temperatures and drizzle. The only bit of unpleasantness for us was getting through US customs in Minneapolis-St. Paul (MSP) on the return trip. We arrived at MSP within a day of an explosion at an airport in Turkey. Consequently the TSA sphincter had already slammed shut at American customs and passport control entry points and security theatre had gone full Hollywood. From Denver the total flight time on Delta to Keflavik was about 8 1/2 hours. We arrived on the summer solstice so for our 8 days in country there was effectively no darkness, just a few hours of twilight. Our experience with accommodations was positive. Most nights we stayed in a guesthouse. These are essentially a B&B arrangement, but the proprietors were not resident in the same building as may be the case in other countries. Breakfast is optional so be sure to select it when booking a room. I used Booking.com and had not a speck of trouble with it. However, once in country I did notice that the guesthouse options were much more extensive than what appeared on the Booking.com website. There are several ways to explore Iceland. There are numerous day tours available from Keflavik and Reykjavik as well as more extensive guided bus tours. A colleague took a 12 day self-driving tour through an agency called Nordic Visitor. They drove themselves from point to point around the Island on the ring road. Nordic Visitor pre-arranged for accommodations and excursions like glacier hikes, etc., along the route. Center, the island of Surtsey, newest of the Westman Islands, Iceland. We took a chance and planned our own tour with a rental car. Not knowing the scale and drive times between places of interest was problematic. Highway speed was 90 kph at it’s greatest and often 40 to 70 kph in many locations. In town the speed was usually 30 kph. I took a conservative approach and stayed within what turned out to be about 7 hours from Reykjavik. Really, this was too conservative and prevented exploring the eastern side of the island. On the positive side, this approach prevented us from spending all of our time driving. Iceland is a geologist’s paradise. It arose from the divergent drift of the Eurasian and North American plates at the mid-Atlantic ridge – a global feature that dominates its geology today. The island has many active volcanoes as well as glaciers. Many of the volcanoes are actually under a glacier. When they erupt there may be large floods as the ice melts from the volcanic heat. The volcano Hekla near the south coast of Iceland is part of 30 volcano systems on the island. The picture above was taken from the island of Heimaey in the Westman Islands. These islands make up this volcanic archipelago. Incidentally, nervousness about the state of Hekla lead our car rental agency (Budget) to offer volcanic ash insurance to it’s customers. I’ll admit- I bought it. Best of luck to Dale who leaves McMurdo Station tomorrow for the Amundson-Scott Station. Second year in a row that a friend is off to the south pole. He is delivering a detector array for a radio telescope. The Gold Hill mining district northwest of Boulder, Colorado, is dotted with many signs of mining activity from an earlier time. This district is adjacent to the towns of Ward and Nederland and situated in the northeastern extreme of the Colorado Mineral Belt (CMB). 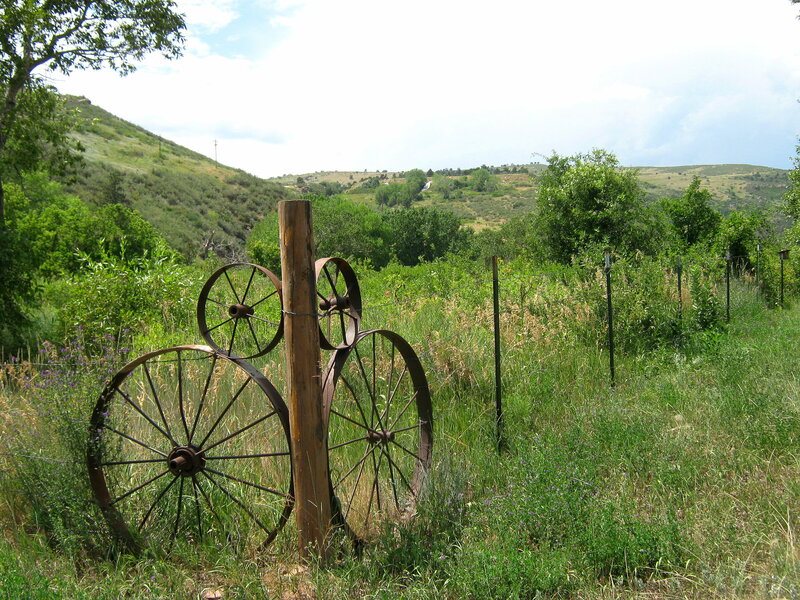 The first significant gold lode discovery of the 1859 Colorado Gold Rush occurred in this area. Gold Hill is at the northern end of a particularly rich band of gold lode occurrences within the CMB stretching southward in parallel with the Front Range through Central City, Idaho Springs, and further south to Cripple Creek. The town of Gold Hill (actually a CDP) is connected to Left Hand Canyon road via Lick Skillet road, reportedly the steepest maintained county road in the USA. I can verify the steepness of this gravel road and would heartily suggest shifting into first gear while driving down this mile-long toboggan run. While mining has long since halted at the great majority of mines in this district, the Cash Mine east of town is still in operation. To the south of Gold Hill is a CDP settlement called Wall Street. This was the location of a mine and a mill. Or they called it a mill. It should probably be called a smelter since roasting was used in the process. No, it's not a Babylonian fortress. 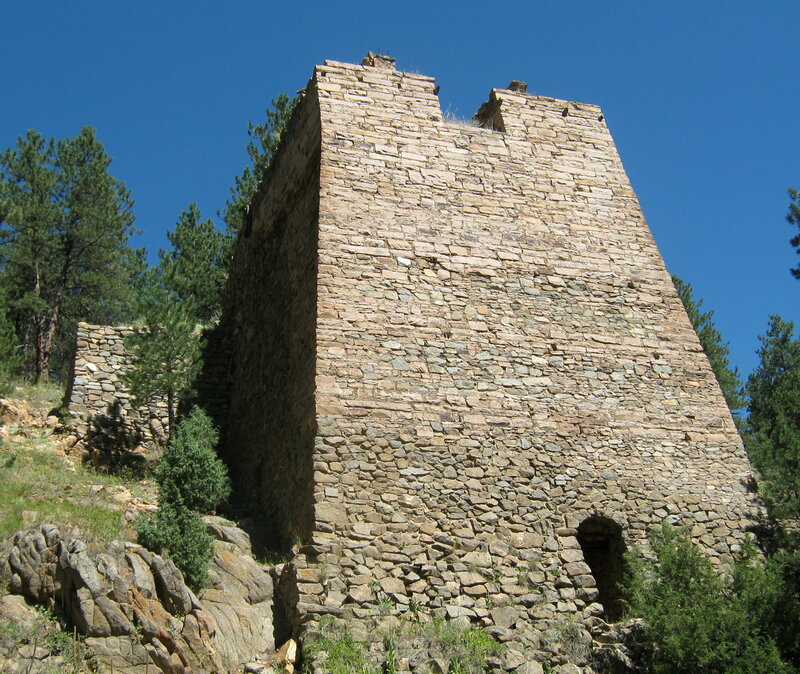 It is part of the Wall Street Mill in Wall Street, Colorado. Copyright 2010 Th' Gaussling. The Wall Street Mill today sits on private property and access is not available to the motoring public. The site sits along the road on Four Mile Canyon Drive, a mile from the intersection with Gold Run Road and south of Gold Hill. The imposing structure along the road is actually a cooling bin for the storage of freshly roasted ore. A sign posted along the road says that the mill process used roasting, chlorination, and cyanidation to recover the gold values. The sign also indicates that the mine closed after only a few years of operation due to poor management. Poor operating practices were not uncommon. Roasting was a common step in the metallurgy of sulfur-rich gold and silver ore. The purpose of roasting is to change the chemical composition of the ore by oxidation of metal sulfides to produce metal oxides. The gold and / or silver in the ore was difficult to isolate without this process. The matrix of metal sulfides in the ore interfered with the extraction of distributed and native gold by amalgamation. And without chemical processing, silver was all but impossible to extract from the ore with 19th century technology. But roasting was only a prelude to further processing. Roasted ore could be crushed in a stamp mill to produce a greater surface area for extractive metallurgy or could release particles of native gold. Reduced, native, gold could then be isolated with shaker tables to partition the dense gold particles into a slurry stream for isolation and further refinement. Alternatively, the pulverized ore could be passed over copper amalgamation tables for dissolution into mercury. A trip to the retort would distill away the mercury (mostly) and afford a button of isolated gold. Gold and silver can be extracted with mercury. Gold that was highly distributed in microscopic particles could be extracted chemically using several options in the late 19th century. Selectivity was always a problem and processing trains became relatively complicated in an effort to provide the purest gold and silver possible. Roasted gold and silver ores could be subjected to chlorination (or chloridation) processes that produced chemically extractable gold or silver. Roasting ore with sodium chloride in a reverberatory furnace, for instance was commonly done to produce gold and silver chlorides that were accessable via aqueous extraction methods. The origin of metallurgical chlorination traces back to von Patera in the Bohemian silver mining town of Joachimsthal. Chlorination by generation of Cl2(g) was not uncommon. Wetted ore was exposed to freshly generated chlorine, producing metal chlorides in the roasted ore pulp. A process similar to the method of Scheele in 1774 (MnO2 + 4 HCl-> MnCl2 + 2 H2O + Cl2) was used to generate the chlorine on the spot for chlorination. Manganese dioxide, sometimes referred to as the peroxide of manganese, was treated with sodium chloride and sulfuric acid. Gold chloride could be extracted by water and then reduced to gold powder with zinc, iron scrap, or green vitriol (iron (II) sulfate, a 1-electron reducing agent). Cyanidation was also used according to the information at the site. I’ll leave this method for another post. An assay office sits adjacent the mill. The upper level of the assay office served as a residence and pool hall. At its peak, this site was home to 300 people. 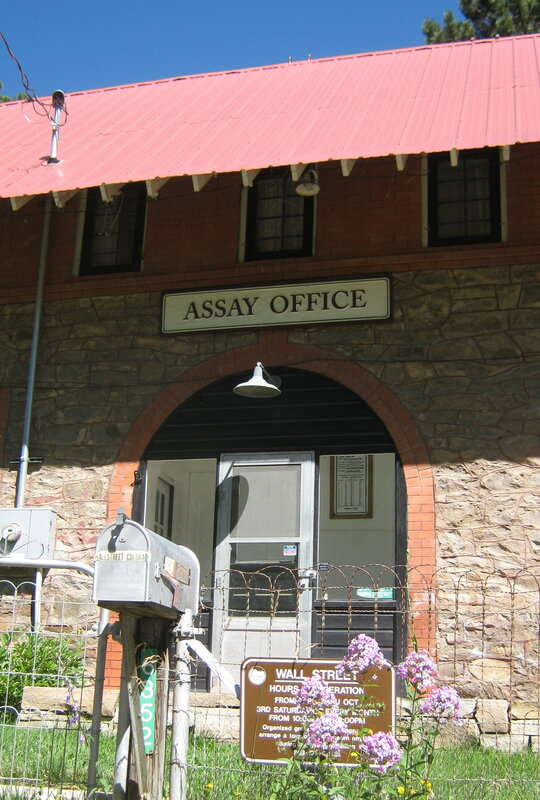 The Assay Office is now maintained by Boulder County. Every once in a while fate brings you to a location that you’ve lived by, but have never visited. We had the occasion to visit a local ranch that markets itself as a working ranch and event center. The ranch, which will go unnamed, sits in the Little Thompson River valley along the Colorado Front Range. It is one of the very few river valleys that does not have a public road in it. The ranch defies easy description. The rancher has dedicated the property to open space, so McMansion construction will not fill the valley with subdivisions of tedious, look-alike housing with black Escalades parked out front. He wants to keep the property, well, not wild exactly, but early 20th century ranch style. 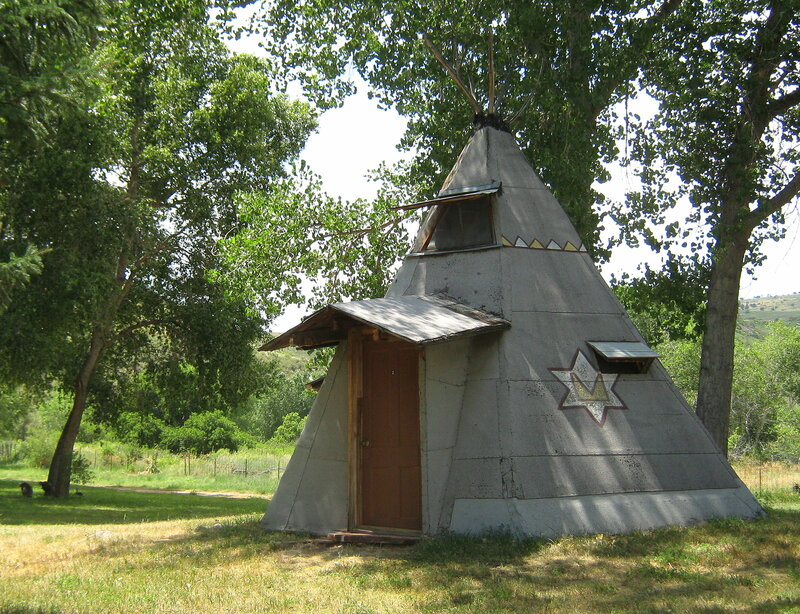 The ranch has a campground with unimproved space for campers and tents as well as a half dozen pentagonal pyramidal structures referred to as Tee-Pees. 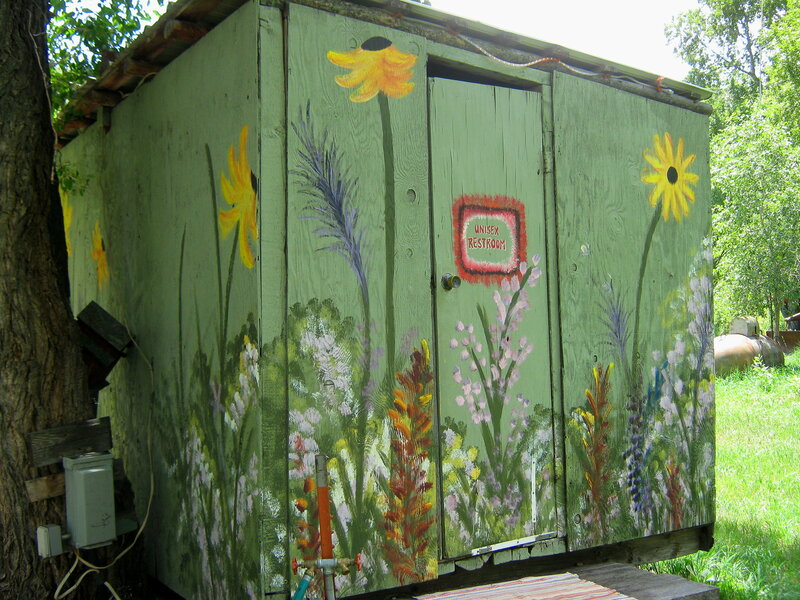 These Tee-Pees are covered with rolled tar paper roofing and festooned with images of native American artwork. I’d say it’s pretty kitschy. The restroom facilities are nearby, festive, and unmistakable. The ranch is quite large and sits on the north side of Rabbit Mountain, sometimes known as rattlesnake mountain. This is rattlesnake country and you need to be wary when charging through the grass to get that great photo. There are plenty of places to sit over yonder at the dance hall. 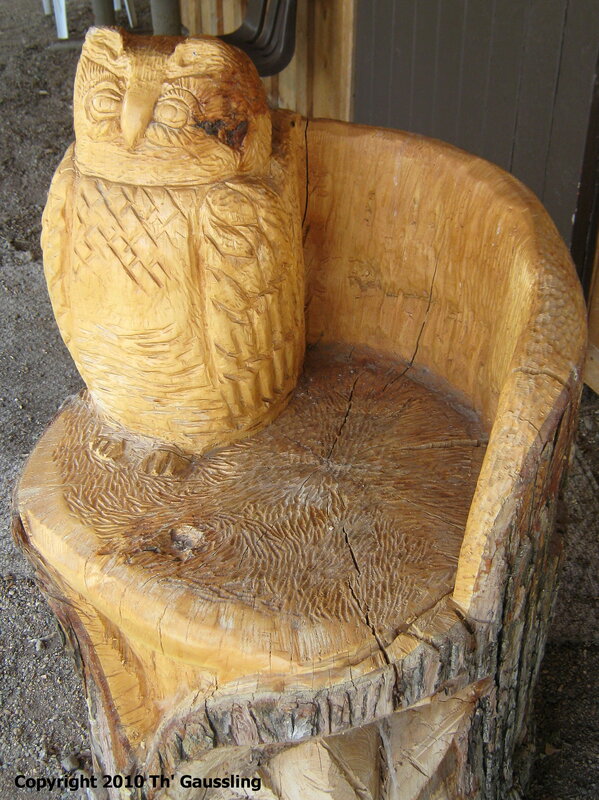 This bit of folk art is there for you to rest your weary feet. 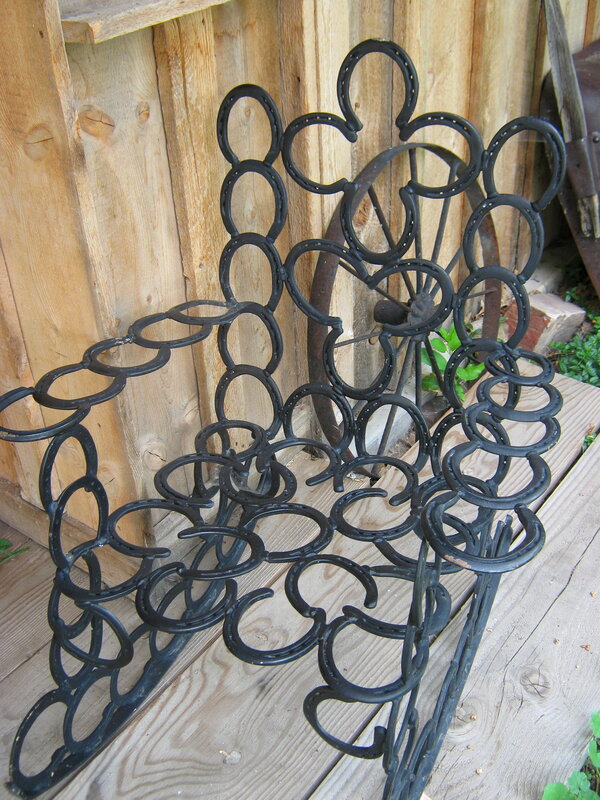 Of course, if you give an arc welder to a rancher, there is no telling what he’ll come up with. There is much to be learned from a day on the ranch. For the keen observer, metaphors abound. 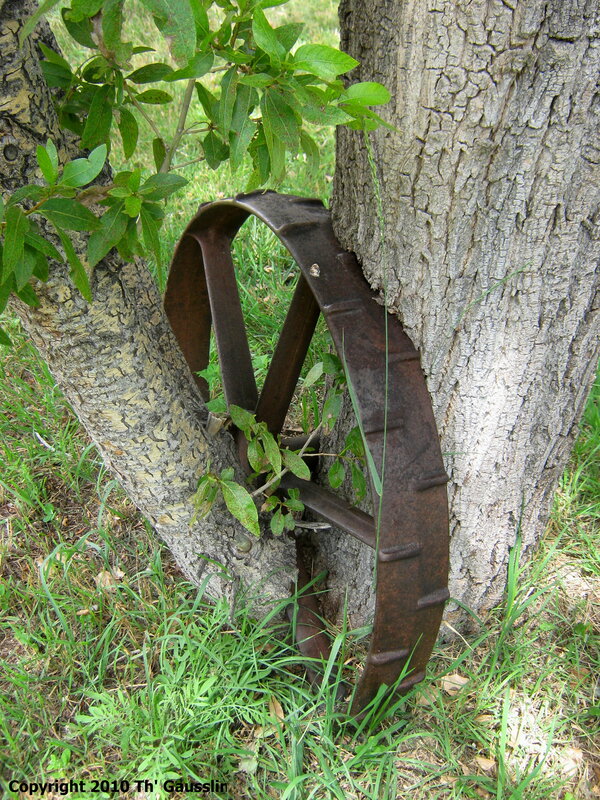 While a rolling stone gathers no moss, a standing wheel gathers a tree. 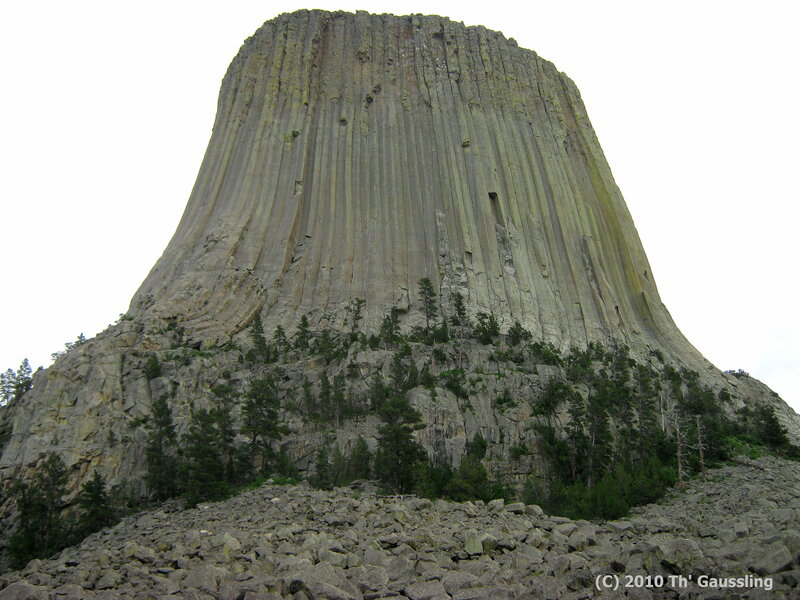 If you’re wandering the country on I-90, say to or from Sturgis, SD, a stop at the Devil’s Tower north of Sundance, WY, is very worthwhile. The identity of this geological oddity is the subject of some disagreement. Three theories of its origin are in play: 1) an igneous stock, 2) a volcanic neck, and 3) the remnants of a laccolith. Whatever the case, it is plain that the sedimentary rock surrounding it has long since eroded away to reveal the more weather resistant igneous rock. 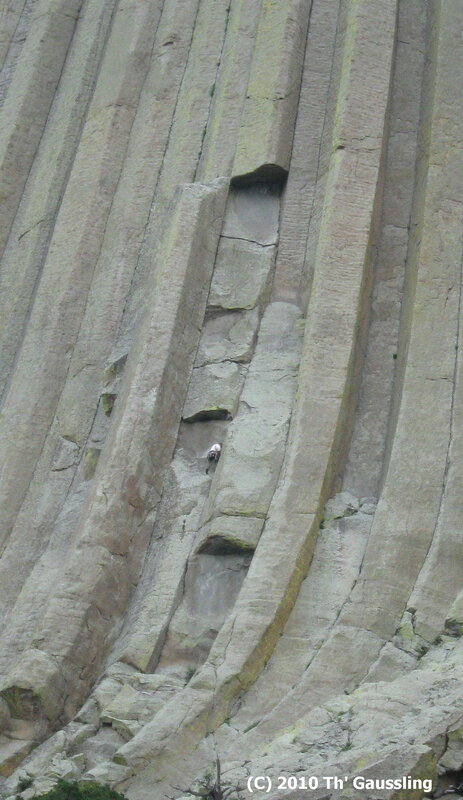 Close up, the columnar structure of the formation is evident. This feature speaks to a slow cooling process, one made possible for a magmatic body deep underground insulated by the surrounding formation. 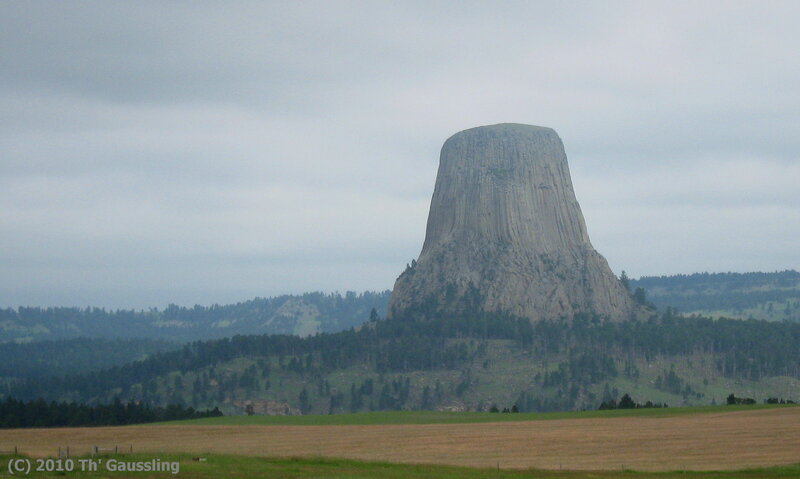 Devils Tower, Wyoming, June 2010. The Black Hills- Of Chiselers and the Chiseled. The Black Hills are a mountain range that stand in the southwest corner of South Dakota and extend a bit into northeastern Wyoming. The area is known for the natural beauty of its forested mountains and green meadows. The relatively low population density along with the dramatic monuments and natural wonders make this a satisfying destination. In rather stark contrast to the panoramic beauty of the area, however, is a geopolitical history that is quite a bit less than pristine. After decades of expansive settlement from the US in the east and the corresponding conflicts, a treaty was forged in 1868 between a confederation of northern plains Native tribes and the US government. 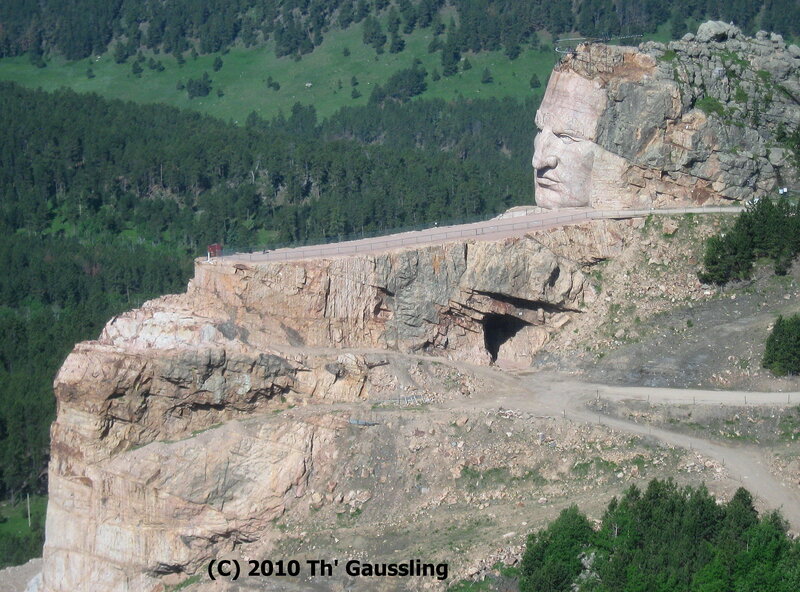 This treaty deeded the Black Hills region to the Native confederation. Within a few years the Native American confederation lost possession of the land granted to them by the Treaty of Ft Laramie. It seems to have happened not so much by the US government backing out of its obligations, but by lack of decisive government enforcement of the terms of the treaty. The discovery of gold in 1874 by the Custer expedition and the prompt announcement of this discovery lead to an irreversible economic migration to the area by gold seekers and those who would follow them. Many of the gold seekers were miners and entrepreneurs from other gold fields seeking new opportunity. Custer met his end in battle, hopelessly outnumbered by Indian forces. Today the Black Hills of South Dakota are a locus of tourism, gambling, and recently, neutrino physics. Native Americans reside on a handful of reservations scattered throughout the eastern plains. It is a curious contrast to behold. Today automobiles and tour buses disgorge well fed tourists by the hundreds of thousands each year to marvel at the spectacle of Mt Rushmore, buy souvenirs, and to rejoice in nationalistic self satisfaction. Bikers make the annual sojourn-in-leather to nearby Sturgis in part to celebrate the freedom of motorcycling. All of this celebration of freedom in an area where the lust for gold has trumped the freedom of a hunter-gatherer society by those who had mastery of explosives, metallurgy, and steam energy. I suppose it was inevitable. Th’ Gaussling and family splurged (Yoww!!) on a helicopter tour of the Mt Rushmore and Crazy Horse area. It was just spectacular. The heliport was a mile from the Crazy Horse Monument so we were treated to two visits to the site. 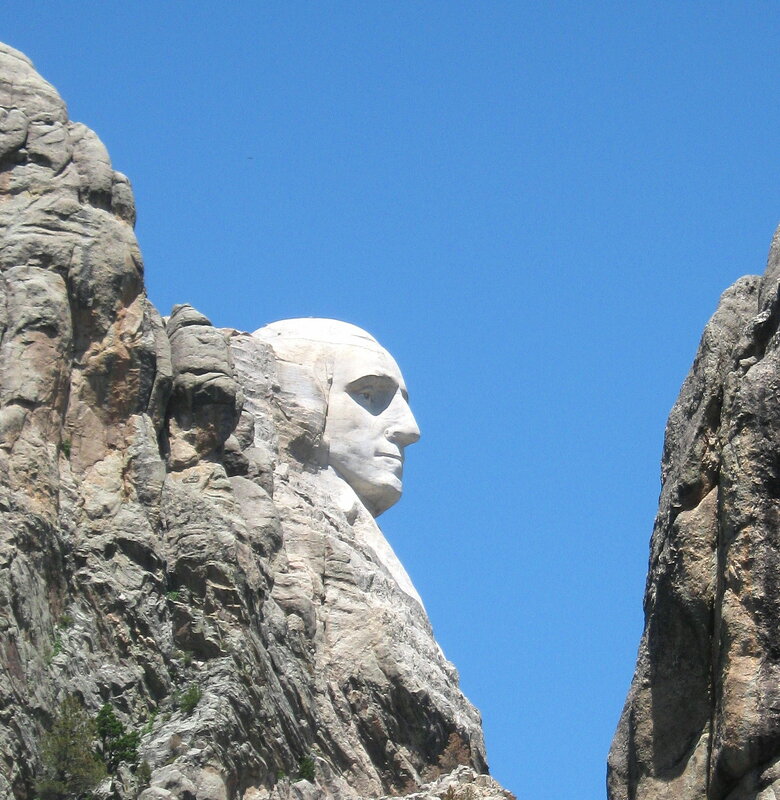 Gutzon Borglum launched his ambitious monument project on a mountain the locals called Mt Rushmore. The final form differed somewhat from early models. 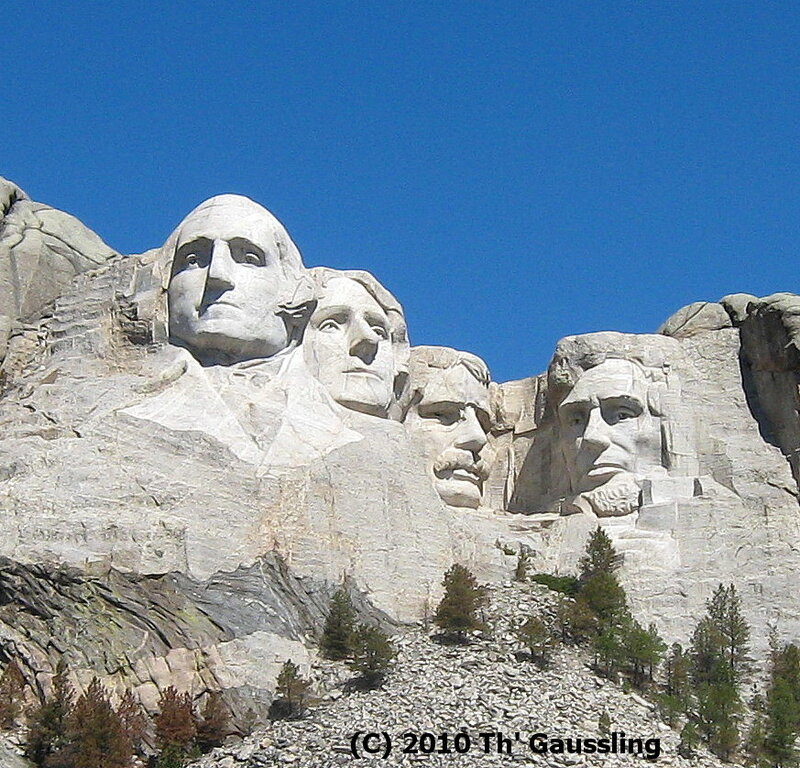 A great deal of resources and effort went into the Mt Rushmore monument. It features a parking garage, gift shops, museum, two indoor theaters, an amphitheatre, cafe, and Borglums studio. The visior is free to simply sit and ponder the monument or dive into the historical details of its construction. 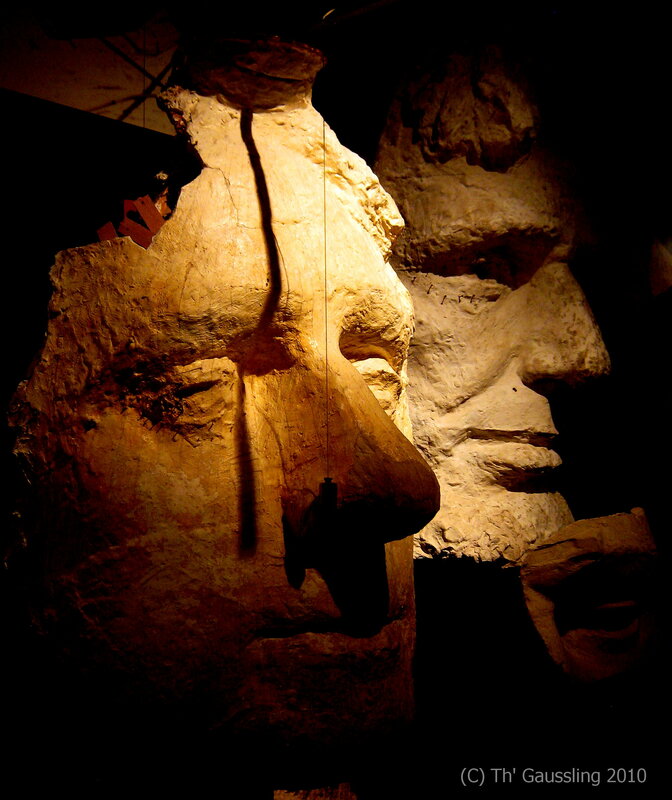 Borglum fabricated scale models of the subject faces in his workshop below the site and used a geometric device to transfer the dimensions to the mountain. A plumb bob hung below a protractor-style device mounted on the model. A rudimentary coordinate system would provide a basis for scale-up. Borglum died of complications from surgery in March of 1941. 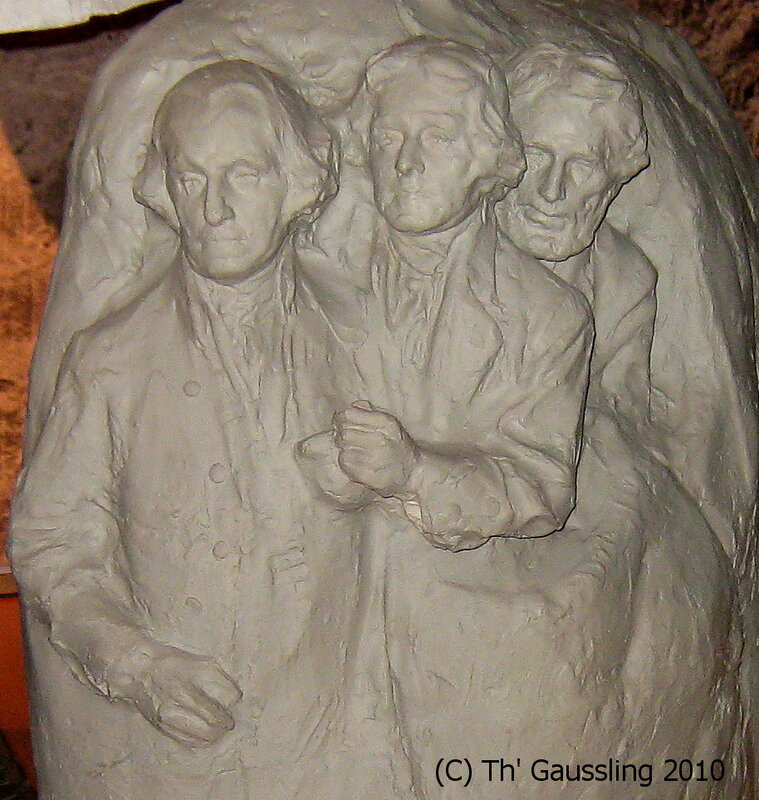 Gutzon’s son Lincoln Borglum carried on with the project after his death. However, Lincoln left the project substantially in the form left by his father. The project was officially halted later in 1941 owing to a lack of funding. Mt Rushmore is a spectacular thing and everyone should see it. All of the fellows captured in stone had attributes worthy of meditation. The timeline between them and we of the present day is jam packed with fantastic events that they had a hand in initiating. I’m certain that they would say that our technology is different but human nature is the same. Just a quick comment on a mining related place to visit. If you find yourself knocking about in Wales, particularly near Snowdonia, it is worth taking the time to visit the Llechwedd Slate Caverns. It is quite sobering to see the working conditions the miners endured, hacking at dark rock in the flickering candlelight. After an insane week in the lab a road trip to the cool meadows of the nearby mountain range was just what the doctor called for. It was the last weekend before the family- one teacher and one kid- return to school. Summer break 2009 is history. We piled in the car and pointed it uphill towards Leadville, Colorado. The planetary atmosphere thinly blankets this insanely high mountain city. It was just what I needed to clear my scrambled mind. Nothing like blinding sunshine and mild oxygen starvation to reset a brain in chronic spasm from sensory overload. Leadville sits at 10,152 feet above sea level. If you doubt the effect on your stamina, just take a short sprint in any direction. Or just plod up the stairs of your hotel. Lordy. All of those business dinners- all that lovely Cabernet and creme brulee- and years of driving a desk have caught up with me. Leadville is located in the Colorado mineral belt and began to populate with fortune seakers about the time of the Colorado gold rush in 1859. Some placer gold was found in the streams, particularly in what was then called California Gulch, but for the most part Leadville became a silver camp. In 1874, two investors with metallurgical training, Alvinius B. Woods and William H. Stevens arrived in Leadville and analyzed the muds found in the local sluicing operations. According to A Companion to the American West, edited by William Francis Deverell, (2004, Blackwell Publishing, ISBN 0-631-21357-0, p. 319) Woods and Stevens found the heavy black mud so problematic for gold sluicing was in fact composed of lead carbonate with high levels of silver. Woods and Stevens invested $50,000, quietly buying as many claims as they could and began hydraulic mining operations immediately. By 1890 there were nearly 90 mines in operation employing 6000 miners. At its peak there were 14 smelter operations supporting the mines. Leadville was a genuine boom town with the expected mix of characters. A mine is a hole in the ground with a liar standing at the top. All mining towns have characters who go on to dominate local legends and stories. Among the well-known-for-being-famous rags to riches to rags players in Leadville are Horace and Agusta Tabor, along with Horace’s mistress and 2nd wife, Elizabeth “Baby Doe”. To make a long story short, Horace was a struggling shop keeper who invested in a mine east of Leadville. Though it was salted by the previous owner to entice buyers, Tabor dug 25 ft further down the shaft and struck a rich and extensive vein of silver ore. The operation was called the Matchless Mine, after Tabor’s favorite brand of chewing tobacco. According to the tour operators, Tabor operated the Matchless Mine 24/7 for 13 years, pulling an average of $2000/day of silver out of it. At its peak, the mine is said to have employed 100 people. Miners were paid the common rate of $3.00 per day to climb 365 ft to the bottom of the shaft for 12 hour shifts. The underground workings of the mine followed the vein structure and focused on sending concentrated ore to the surface. Buckets carrying approximately one ton of ore per load (my estimate) were tipped into ore carts and rolled into the ore house for hand sorting. The most highly concentrated and valuable ore was dumped down a chute for loading into a rail car and the gangue (or tailings) was dumped into the gulch. An assay building (not shown) was on site to provide a continuous assay and accounting of silver sent to the smelter in Pueblo, Colorado. Unlike many other mine operators, Tabor owned a rail operation and had a spur at the mine for pickup and delivery of ore. Many mine operators had to employ mule-skinners to cart wagon loads of ore to a rail siding for transport to the nearest smelter. In 1893 the repeal of the Sherman Silver Purchase Act and the collapse of the railroad industry bubble were part of a panic that lead to a crash in silver prices. Tabor lost everything and, as a respected public figure, was appointed postmaster of Denver for a short time. Eventually Tabor died at age 69 in 1899. Ex-wife Agusta had invested her divorce settlement wisely in Denver and lived comfortably. Widow Baby Doe Tabor was found frozen stiff in her shack at the Matchless Mine in 1935. All of the digging from the boom time of Leadville has left an enduring legacy for those who live in the watershed. Much of the mining activity occurred uphill, east of the city and as a result, that area is pock marked with many large colorful tailings heaps. While the colors are interesting to ponder and sample, the ground and surface waters are greatly affected by aqueous extraction of metals from these piles. If you stand next to one of these heaps, you can’t help but notice the smell of sulfur. The ore and tailings are enriched in sulfides and once exposed to air and water, oxidation occurs to make corrosive runoff. This is a kind of heap leaching phenomenon that will eventually exhaust itself, but only at the cost of water quality. Touring the Mollie Kathleen Mine, Part 1. By way of a prelude to this post let me say that, as a child, I was plagued with nightmares about elevator shafts. A tallish building in a nearby city had an elevator that, in the style of WWI-era buildings, was comprised of an open cage controlled by a matronly operator. On each floor the entrance to the elevator shaft was guarded by a collapsible metal gate that allowed the visitor to see, hear, and smell the greasy workings of the elevator in all its cabled creepyness. I would stand next to the gate as the elevator went about its single-minded business and peer down into the dark shaft with its writhing black cables, fascinated yet deeply in tune with the prospects of what a fall down this hole would mean. Like most young boys, I had bitter experience with the unblinking and impersonal side of gravity. It was this memory that flashed into my mind yesterday as I stood in a manlift the size of a large domestic refrigerator, crammed tightly into the cramped cage with 6 other people. We looked like a can of vienna sausages. The lift was a double-decker, with an identical cage of sausages below. There we stood- a squashed parcel of humanity and hard hats in the orange lift, dangling above a 1000 ft column of air. Outside I could see the town of Cripple Creek, Colorado, sitting in the valley 400 ft below us. In two minutes, we would be 600 ft below the level of the town. As we began the descent and as daylight fell to darkness, I felt a my autonomic system select “Panic Mode”. But it was too late, we were committed. After 30 seconds, a graveyard calm replaced my momentary panic and all was well. This was my first entry into the Mollie Kathleen Mine outside of Cripple Creek, CO. The tour begins in a drift 1000 ft below surface level. A “drift” is just a horizontal tunnel in an underground mine. I have toured a number of mines and caves and the common attribute to all of them is the absolute silence that is found underground. Today’s tour would be different. The Mollie Kathleen Mine sits on the side of a mountain adjacent to the mammoth Cripple Creek and Victor (CC&V) open pit gold mine. The operators of both mines have independent claims to different parts of the same confined geological formation. The Mollie Kathleen is one of a great many underground mines in the area, of which only a very few are in operation today. It is presently open only for tours. The CC&V mine is the only large gold mining operation in the area. The CC&V mine is an open pit operation. Large hauling trucks carry 300 ton loads of ore rubble from the pit to nearby crushers which reduce the rock to 3/4 inch pebbles in preparation for the cyanide extraction process on the heap. The rubble is the result of large scale bench blasting with ANFO blasting agent. The CC&V does blasting on a regular basis. That day, while we were underground about 1-3 miles distant (my estimate), they set off a blast. We were down in the mine when the underground rumble hit. There was no ramp-up to maximum force- it began as a loud, strong rumble seemingly from every direction. We stopped in our tracks and instinctively looked at the ceiling trying to decide if this was a normal or off-normal event and, oh golly, will the the tunnel collapse? After 30 to 40 seconds the rumble subsided and the mine was silent again except for a few heartfelt expressions of relief. Clearly there was no danger for anyone, but the abruptness and the magnitude of the explosion only serves to remind one of the compromises made and the options lost while working underground. The tour guide was a young ex-miner from Montana who explained mining practices and demonstrated the numerous pneumatic tools used by hard rock miners. In part 2, we will look at some of the mine workings and other features of the Mollie Kathleen Mine. Hard Rock Placard. Photo Copyright 2009 Th' Gaussling. It would be easier and would consume less bandwidth if the days in California without a wildfire were reported, since they seem to be fewer in number. What will the Feds do if California legalizes and taxes pot? Will they declare it a Narco-state and allow Lou Dobbs to supervise the construction of a morality fence along the borders? What affect will it have on the SWAT apparel and black helicopter industries? This could give a whole new range of possibilities for our next Disneyland vacation. To hell with Florida!